This is only the second fiction novel I’ve read by the “Master of Horror” Stephen King, the other being The Dead Zone (although I’m halfway through The Stand), and I, in honor of an adaption of a book I’ll never read coming out this week, decided now was a good time to review The Eyes of The Dragon. 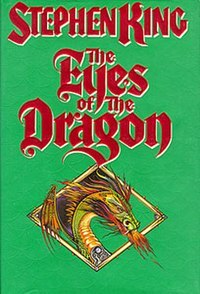 The Eyes of the Dragon is a pretty straightforward fantasy novel, other than having some overlapping characters and themes it stands outside what people usually consider a King book to be like. There are very few overtly horrific images or scenes and for the most part it is a book that could be read by young and old alike. The plot revolves around a kingdom in turmoil. The king is old and dying and his chief advisor is an eerily familiarly named man named Flagg who makes claims to be a magician. The king has two sons the oldest one, Peter, is known well loved and noble, and the younger son, Thomas, is almost ignored except by Flagg. Like many stories revolving around kings and their sons there is a jealousy that develops amongst the brothers. Soon Peter is framed for a crime and Thomas rises to “power.” The rest of the book follows the ramifications of these two events and the possible reconciliation. I enjoyed reading this book, but it didn’t wow me. I suppose I had unrealistic expectations, especially after having read so many innovative and fantastic fantasy books in the past few years. I think a good comparison for this book would be the Farseer Trilogy by Robin Hobb. While neither those books nor this one are particularly bad they just don’t compel me to reflect or reread them as much as some others may. Perhaps the fault lies in me? I can’t really be sure, but I think King was trying to write a straightforward old-fashioned fantasy story. While some of King’s trademark symbolism and his popular themes, Children overcoming evil being the biggest, the overall story is very classical. There is very little to make it stand out as being from a particular time period. It could just as easily been written in the first half of the 20 century as the second half. This element makes it a unique book, so many novels follow a trend to capitalize on popularity or at least reflect the cultural trends of the day, even when they are suppose to be set a long, long time ago in a land far, far away. Yet this book doesn’t do that, instead it almost deliberately tries to be old fashioned and classical. I admire it for that. If someone has been wanting to read King or is looking for a shorter fantasy book that won’t give them headaches with backstory and magic then this book might be for them.